Updated. Fon may have launched in Madrid, but lately the company has taken on a very Japanese flavor. According to the company, which pioneered the concept of a global community Wi-Fi network, 1 million, or a full one-sixth, of its global access points now reside in Japan. It owes a big part of its success there to operator partner Softbank Mobile, one of Japan’s largest carriers with 25 million subscribers. Softbank gives every customer who buys a smartphone or tablet a Wi-Fi router, which Fon calls a Fonera, and automatically configures all of its devices to access Fon’s network. Considering Softbank for years was the only carrier in Japan to sell the iPhone (s aapl), you can imagine how considerable that traffic is. Fon was originally launched to connect laptops, but today in Japan 80 percent of its traffic comes from either the iPhone or iPad. For those of you who aren’t familiar, Fon was born in 2006 with the aim of building the world’s first global community Wi-Fi network. Fon members, or Foneros, buy a Wi-Fi access point or router that hosts both a private network for the user’s home or office and a public network. Members get free and automatic access to all other Fon access points, and Fon sells access to non-members via subscriptions or day passes. Fon was a pretty revolutionary idea when it launched, and consequently it attracted some impressive investors – Google(s goog), Skype(s msft) and Sequoia Capital all invested in the beginning, and later Skype co-founder Nikas Zennström’s Atomico and British Telecom(s bt) signed up for a piece of the action. Fon didn’t exactly take off for the clouds though. Its business model depended on selling hardware to customers, which made viral growth difficult. It competes against the likes of Linksys(s csco) and NetGear(s ntgr) on store shelves. While it offers a community network those two companies don’t, the value of that network depends on reaching a critical mass of members, which it failed to achieve. In May, Fon announced it had 6 million access points in 100 countries, which may sound like an awful lot. But to put that in perspective, in April, French telco Iliad launched a community Wi-Fi network with 4 million access points with a mere flip of a switch – that’s in a single country. When you’re talking on a global scale, 6 million access points is paltry. The biggest complaint I have heard from Fon users is they can never find a Fonera to connect to. There are signs, though, that Fon’s fortunes are changing, in large part due to the smartphone explosion and carriers’ new willingness to use Wi-Fi to relieve their congested mobile broadband networks. Nowhere is that more evident than in Japan. According to Fon, Softbank has cut its 3G mobile data traffic in half during peak hours by offloading that traffic onto Fon routers. Since Softbank has every interest in making Fon’s network as big as possible, it distributes Fon’s routers to all of its customers for free, which solves the critical mass problem. In the U.K., BT has uploaded software into its home routers that turn them into “soft” Foneras. Those carrier deals are starting to drive a growth spurt for the company. Fon says it’s adding 1 million members every three to four months. The typical smartphone user redirects 500 MB to 1 GB — depending on the country — over Fon’s networks and connects on average once very 36 hours. Those are some mighty tempting figures to an operator looking for ways to conserve 3G and 4G capacity. Japan is by far Fon’s most successful market, but Fon could easily repeat that success in other countries if it finds the right partner. My bet is that Fon is eyeing France, which is embroiled in a vicious price war sparked by Iliad’s Free. All of France’s big three are looking to Wi-Fi as a means of combating Free’s ultra-cheap voice and data plans. Bouygues recently signed a deal with Devicescape to gain access to its virtual hotspot network. Orange is leaning on its public Wi-Fi hotspots. And, of course, SFR has contracted with Fon. Update: An earlier version of this post incorrectly stated that Softbank was the only carrier in Japan to offer the iPhone. Softbank lost its exclusivity in October when KDDI began offering the iPhone 4S over its CDMA networks. I think it’s important to let Fon members who have shared their home bandwidth on the understanding that they would be able to access all the Fon access points world-wide know that they ARE NOT able to access Softbank’s fon-spots in Japan unless they also have an account with Softbank. They can still access the user-owned fon-spots of which there are quite a few, but usually, in Tokyo, if you see ‘Fon’ available on your device (shops, restaurants, train stations etc.) it will be Softbank owned and they won’t let you access data without a Softbank 3G connection to setup your device. I live in Tokyo, have a working Fon router and I have an iPod touch, iPad and MacBook Air but can only connect to private fon-spots. I’ve just given in and signed up for a Softbank iPhone (which of course, is the reason they’ve done this along with taking some of the strain off the 3G network). So while the article may be right in proclaiming Fon’s success in Japan, most of the users who helped establish the network will not be able to benefit from it here. The map shows hotspots worldwide and can be searched by location. Regrettably, I see that ShairAir shows hotspots which I know to be long dead too. Perhaps they just publish locations provided to them by Fon? Each hotspot connects with Fon’s servers periodically to let them know it is still functioning. We call this it’s “heartbeat”. A group called FrancoFon had a means to determine whether each Fon hotspot was responding or not. 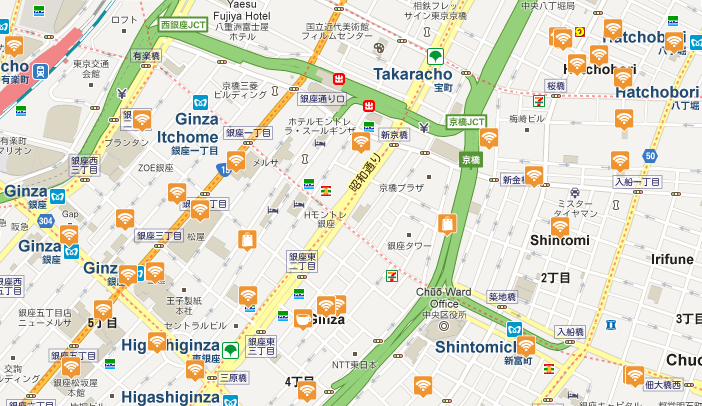 It mimicked the Fon Map’s ability to show Live vs “recently dormant” hotspots. This status was polled from Fon itself, so there is no question about a hotspot’s death. It showed that the clear majority of registered Fon hotspots were dead, and that Fon was not clearing them from it’s database. Compared with Fon’ statements about how many Foneras they had sold and given away, it also showed that a clear majority of Foneras had never been registered. As of today, Fon’s Map doesn’t even attempt to differentiate dead vs live hotspots. I can no longer even find the hidden checkbox to “hide inactive” icons now. That would wipe the map clear of icons, even around Fon’s HQ in Alcobedas, ES. They just show an icon where any Fon hotspot has ever existed. This is not accurate, and I think many people would call this fraudulent. great article. Thanks for recognizing our efforts and thanks to the entire Fon community for helping us to grow the network! I am sorry that you are still bitter about Fon. I spare the readers of this blog to discuss the background. Let me just say that Fon has grown tremendously in the last years. Coverage in many areas, specifically in Europe and Japan is great. In other areas we are rapidly improving the coverage – for example we just launched a large scale partnership with Oi in Brazil which will add Millions of Fon Spots in Brazil. The growth model with Telco partners is proven and adds a lot of value to the Fon community, including yourself. Believe it or not, we have over 6 million hotspots active – all being accessible to the entire Fon community. Our company is being audited by a leading auditing company. (I invite you hereby to stop by our office and we will lead you trough each and every detail of how this is put together and how we add +/- 1 Million every 3 months). Thanks for being a Fonero! Fon’s ACTUAL Hotspot number being AUDITED? Let me doubt about it… you guys have been promising publishing those AUDITED numbers for 3 years now. You know there are not even 20% ONLINE out of the 6M hotspots you advertise and that is the real reason why Kevin in his article states “The biggest complain I have heard from Fon users is they can never find a Fonera to connect to.” Please give some REAL AUDITED numbers as you promised 3 years ago or just don’t publish more fake numbers anymore, the more you keep increasing those fake numbers the worst will be the impact when you and your investors get the REAL NUMBERS! Notice Alex does not EVER address the substance of what I write about Fon, he only tries to coat me with some emotion to make me seem invalid. Character assassination is the route of the desperate. Folks should know that Fon President Martin Varsavsky emailed me that Fon was an “open company” with “no secrets” and that Alex would be glad to answer my questions since Martin was so busy. Alex then refused to answer my questions about Fon’s contribution to the aggregate WiFi network, citing “confidentiality” with partner networks. He terminated the exchange after I reminded him that I got my numbers from public websites of these partners. It was too dangerous for Fon to confirm or deny my findings. And again, I will remind that Fon considers the whole aggregate network of partner WiFi networks to be it’s own “Fon Network”, even when they are the little partner on someone else’s network. Every hotspot, whether live or dead for many years, is presented as a working hotspot. (I JUST LOOKED AND YES, MINE AND MY NEIGHBOR’S ICONS ARE STILL ON THE MAP TODAY. They’ve been dead for over 3 years. You’d think Fon would clear them off within hours.) Every member, whether active or long dormant, is presented as a regular user of a vast, healthy thriving WiFi network. Forever. Much may have changed since I abandoned my Fon hobby, but folks should know what kind of moral foundation Fon is built upon. They should know that Fon’s representatives have a pretty face that conflicts with their behavior. They are very good at slick-speak. Alex, I hope Martin does not leave you with too much work to do while he travels the world at Fon’s expense. One little 5-minute speech about Fon at a coffee shop somewhere makes it a business trip, no? You have my email address. PLEASE let me know when Martin is coming to Austin TX as I would LOVE to toast to his success in person! Another little gem: I was interviewed by a New York Times columnist about Fon. He said they had told him that Fon was named in honor of the North African indigenous tribe of the same name. Counterparts to the Zulu elsewhere. Yeah. Just because. And Fon tries really hard to pronounce Fon as “fawn” to further distract folks from the obvious conclusion that it’s some sort of Internet PHONE company. I have been assured that in Spain, where Fon is founded, most people would pronounce Fon nearly the same as “phone”, which was the original intention. With all due respect, Fon brought all of it’s troubles upon itself. I am AustinTX, formerly Fon’s longest-running fan blogger. I have been very disappointed at Fon’s tricks, historic revisionism and general contempt for it’s once-enthusiastic volunteer base. Fon’s business plan depended on reselling the volunteer member’s wifi to others who had no wifi. This was done by distributing a free firmware upgrade for many popular routers. They failed to sell wifi, and failed to maintain a good relationship with their firmware author, so they turned to selling a locked-down router with another firmware pre-installed, with attached false promises of free wifi everywhere in the world. I cannot emphasize enough the fact that Fon made many promises and other statements, which, when taken in the conventional way, meant something totally different than the relevation which came weeks or months later. They are masters of slick-speak. For instance, when everyone had Linksys and Buffalo routers, they promised a new firmware that would create two separate hotspots, or SSIDs, so that guests could use a hotspot that required Fon login, while the other was WPA encrypted for the owner to use. Instead, they rolled out the Fonera router, and WPA was set by default to the highest setting, which wasn’t compatible with many WiFi chipsets. The dual-SSID feature was also incompatible with Intel PRO chipsets. Many Foneros were unable to even associate with their own Foneras. Another time, they said that we could make free Skype calls if we bought their WiFi-VOIP handset. In truth, this was impossible for many months unless you were somehow given the WPA key of each hotspot, since the handset’s Fon hotspot login script didn’t work yet. It wasn’t an issue of being buggy, they sold the handsets with this promise months before the script was even available. They also say that they “split” the profit collected at your hotspot with you. Actually, they split it 3 ways, and place your third in their “piggy bank” until you have a large enough sum that you are allowed to transfer it to PayPal. In UK, 33% accounts for VAT, PayPal fees and probably some flash to keep ISPs from blocking Fon’s services. However, they still split it 3 ways in countries like USA where there is no VAT. I was treated with great hostility when I asked them who this money goes to. It suggests they are skimming extra profit from us. Here is the biggest relevation: Fon’s membership contribution to the “Fon Network” is far smaller than you might think. Originally, members (Bills and Linuses) were those who hosted routers. Guests (Aliens) were unambiguously not members. But Fon needed to make some news about crossing a “million members” milestone. So they lumped them together and acted like they had always been members. A little problem, though; an “Alien” membership is/was created merely by connecting to a Fon hotspot, providing a name and an email address, and then you’d get 15 free minutes of wifi. The email address was never verified, and anything that looked like an email was accepted. Measures to prevent the same computer from getting more trial minutes were inadequate. There may have been hundreds of thousands of fake ID provided to get free wifi. It gets worse: Working behind the scenes, Fon offered access to every established WiFi network in the world, most notably with BT’s home routers. Foneros enjoyed reciprocal access, or partial access to some of these networks, but not most. So, Fon basically whored Foneros out in order to partner with other networks and call it ALL the “Fon Network”. And, Fon consisted of only a marginal slice of this aggregate, even though they counted every Linksys and Buffalo router, now unsupported, and every La Fonera router as an operating node, even if they had been offline for years. Or even if they’d been sold, but never registered with Fon’s services. Independent surveys of Fon’s available routers, often blocked blocked by Fon, suggested that most routers were never registered, and the majority that had been were long offline. Fon maintains a hotspot map, which currently shows a LIVE hotspot at any location a router has ever existed. It seems that every member of these other WiFi networks is considered by Fon to be a member. That is how they reach 6 million. It’s actually the efforts of the partner networks. Investors need to know how manipulative Fon is (IMHO). The final irony is that this article attributes Fon’s recent improvements to the spread of smartphones and such which presumably use WiFi for VOIP calls. Back in 2007, Fon originally started as a freely-distributed build of Linux which was to be run on a spare laptop to provide a WiFi hotspot for folks with VOIP handsets and smartphones. The idea was to compete with telcos by providing really cheap rates. This aspect has been buried by Fon, since they changed plans for unknown reasons. So it seems Fon comes full circle. Shameless self-promotion: My blog is still online for folks who wish to learn more about Fon which is not on their official press releases. My blog is also a popular source of ideas for modifying and repairing WiFi routers. It was originally launched to demonstrate the degree of cusomizeability I wished to have for my Fon hotspots (with embedded blog for local news). Then it became a haven for information and discussions which Fon was furiously censoring on their own discussion board. Visit elfonblog.fondoo.net and behold. I’m not the best writer in the world, but you’ll see my analysis of live/dead routers and membership inflation with charts and sources. The comments are also highly enlighening. Maybe wifi-sharing works better in high-density Japan, but good luck with that, in the less denser US. SoftBank is not the only carrier for the iPhone in Japan. AU also has the iPhone since the launch of the iPhone 4S. You’re right Aaron. I over generalized to the point of making the story inaccurate. I’ll add a correction now. Great article. I am on Softbank and being able to get to WIFI on this system has been been very useful. Also when I bought my wifi G1 iPad they gave users 2 years free access to it.